If you love the heritage and period charm of your timber sash windows but don’t like the draughts, rattles, rot and heat loss, then have your windows draught proofed. There are a lot of benefits to draught proofing your sash windows, including: improved insulation, stops rattling, stops dust, stops dirt and helps to sound proof the windows. We install the draught proofing in a discrete method which makes it virtually invisible but very effective. There are literally hundreds of beads, weather strips and draught excluders available on the market today. They come in exclusive styles, designs, materials and applications including compression strips (foam type substance). We don’t use any of these as they are not as effective as the normal brush strip (also known as bristle strip). We only use the best quality brush strip for our customers are this provides the best insulation and draught proofing. Your repairs will be carried out by a professional, which can include replacement of broken glass and missing putty. There will be less hot air going out and less cold coming in thus reducing uncomfortable draughts. Your windows will stop rattling in the wind. You will notice a reduction of noise coming through the windows from outside. Once the seals are installed they are nearly or totally invisible. This method is approved by English Heritage and local authority conservation officers. Finally, and perhaps most importantly you will save money. Seals: Brush seals (fine, nylon fibres) are generally used. 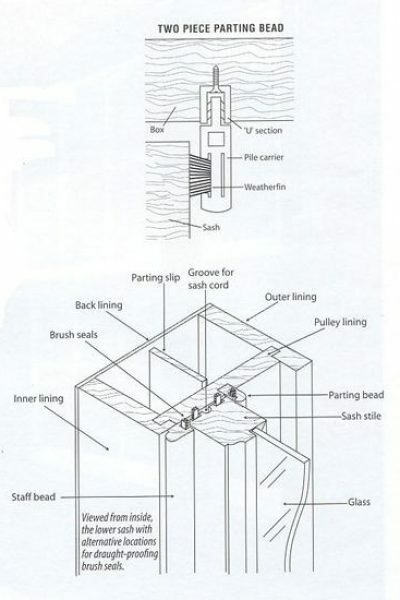 Location of seals: If the parting bead is used to carry the vertical seals, they will be visible and care must be taken not to paint over them, otherwise they will become clogged and lose their effectiveness. Parting bead with seal: Our parting bead comes in timber and we don’t use any sort of uPVC. The disadvantage of plastic is that it usually comes in white only, and if painted, the paint will not stand up well to friction from the sash moving against it, leading to white streaks showing through, particularly if a dark colour has been used. Gas fires and ventilation: In order to function safely, gas-heating appliances need a supply of air. Larger appliances could malfunction if your draught-proofing is too effective – check with the manufacturer and they will assist you with the information required. Building regulations and 'trickle vents': With the intention of reducing the probability of condensation and consequent mould growth, the Building Regulations require a habitable room to be provided with a trickle vent ('background ventilation' of 800mm square in area). Interestingly, this is equivalent to the average gap around the average sash window. Fortunately the same regulation allows you to achieve this by opening the top sash of your fully weather-stripped window!